The cleansing rain. The rain is so beautiful. Rain makes things grow, provides life, can be dangerous, but can provide so much clarity and can provide a state of restfullness. The rain could be like our Father's provision over us. We don't always understand how God works, just like we don't understand why in Heaven's name it rains SO much in Portland. But we trust our Lord, just like we trust the purpose of rain. Why is Oregon so Beautiful? 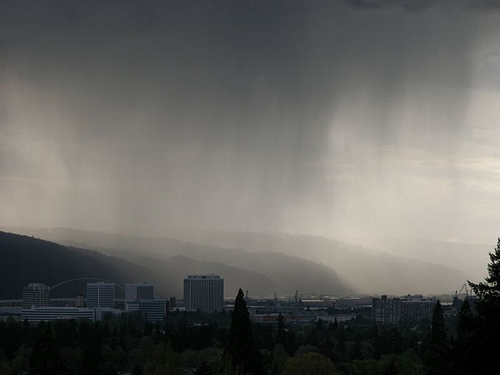 I would argue that the rain is to blame for a lot of Oregon's beauty. To me a day spent inside reading, journaling, reflecting, praying, listening, resting, is the most well spent when the rain is falling outside. The cleansing of the rain outside, like the cleansing the Lord needs to do in our hearts on a daily basis. I pray that this year, 2012, brings cleansing for many of you out there like the rain cleanses our beautiful Oregon.